After his success with "Blade Trinity" as a writer-director, David Goyer takes on "The Invisible" . This time only as director. The film which is a remake of a 2002 Swedish film "Osynlige, Den". Movie that is an adaptation of Mats Wahl novel of the same name. 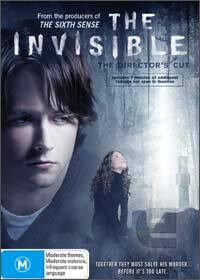 "The Invisible" is the story of Nick Powell (Justin Chatwin) who is a bright high school senior with an excellent future as a writer. The only problem is that his mother (Marcia Gay Harden) doesn't like that idea. As Nick gets close to graduation one night after leaving a party, he is brutally attacked and left for dead in the woods. But in reality he is not dead, he is helpless as no one can see him or hear him. Soon he will find out that the only person that can hear him is Annie (Margarita Levieva), who might be the one able to save him. With time running out Nick and Annie most work together before it is too late for Nick to live again. The film plays a combination of "The Sixth Sense" and "Ghost", so the idea was promising. However the film drags a lot until Nick gets the beating that puts him in a state of limbo between live and dead. After this point the film starts to look interesting. But this doesn't last long since as soon as Nick figures everything out then the film heads down hill from there. Originally this movie was promoted as a thriller but in reality the mystery is lost 40 minutes into the movie. Maybe rent on a quiet night.